2. If nothing is done (and so far the “international community” has done little), the world—including developed countries—will see a second wave of crime in the next five years, which will exacerbate global “gangsterisation”. • In any event, one thing is now certain: we can no longer consider “terrorism” (in its various guises) as a separate entity, different from other global threats and dangers. An ability to effectively understand and combat the enemies we will face in 2016, means acting together now to identify (as “new threats” or some similar concept) the different strains of terrorism and organised crime, along with all their derivative hybrids. 3. 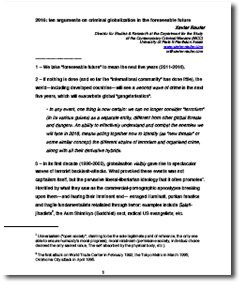 In its first decade (1990-2000), globalisation visibly gave rise to spectacular waves of terrorist backlash-attacks. What provoked these events was not capitalism itself, but the pervasive liberal-libertarian ideology that it often promotes1. Horrified by what they saw as the commercial-pornographic apocalypse breaking upon them—and fearing their imminent end— enraged illuminati, puritan fanatics and fragile fundamentalists retaliated through terror: examples include Salafijihadists2, the Aum Shinrikyo (Buddhist) sect, radical US evangelists, etc.